In case it has escaped your attention, September is the month where people make a fuss about organic; aptly named Organic September. I have to admit that the majority of food that I buy is already organic so for me I wanted to try some new organic ingredients that I hadn’t tried before. I loaded up my weekly veg box with tomatillos, Homity pies and all sorts. 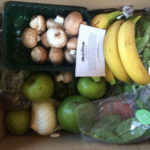 I was challenged as part of Organic September to make an all organic three course meal, for four people, which cost less than £30. I have done a few dinner parties before but not a budget conscious one so I was looking forward to seeing what I could make without going over the allowance. Initially I thought a roast chicken would be quite a good idea but with the cold weather closing in I wanted to make something a bit more hearty and autumnal. My three course menu ended up being as follows: Pea and Bacon Soup (recipe in this post), Beef Cooked with Beer and Onions (see below) and Blackberry and Pear Pavlova (recipe for this one to follow). My total spend in the supermarket to get all the ingredients I needed was £25.85. I already have organic flour, sugar, vegetable stock and oil in my cupboards so if you don’t the spare change allows you to pick up these bits too and have plenty leftover to use in future. I used my change to pick up some lovely organic bread to serve with the soup. Pea and bacon soup is one of my favourite combinations but as I don’t have a freezer I have nowhere to keep frozen peas so don’t get to make it very often. Not to worry though as my recipe conveniently uses a whole bag of peas at once. It makes four big portions, or four smaller ones for your dinner party with two left for lunch the next day. Start by frying the onion and potato together over a low/medium heat with a little oil until softened. Add the stock and bring to the boil. Reduce to a simmer and cook for 10 minutes. Stir in the peas and return to the boil. Reduce to a simmer and cook for 3 minutes. Blend the soup with a hand blender or in a food processor then pour back into the pan to keep warm. Check the seasoning and add any salt and pepper as needed. While the soup is keeping warm dry fry the bacon in a frying pan until brown and crispy. Serve up the soup with the bacon on top. I love what a fantastically vibrant colour the soup comes out. It’s light and fresh but without being too frugal. The sweet peas and salty bacon are classic companions and the potato gives the soup a lovely texture. A sprig or two of mint would be a good addition if you have any hanging about. With the starter all eaten it was on to my Beef with Beer and Onions. 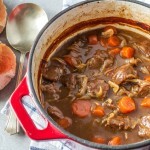 A delicious and slightly cheaper version of Boeuf Bourguignon I love this recipe. It’s one I’ve made before so you can find the recipe here. Slow cooked (for a no fuss dinner party) and simply served with some mashed potatoes and some shredded cabbage that came in my veg box. 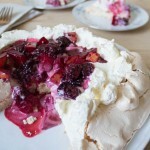 Everything was followed up with my Blackberry and Pear Pavlova, the recipe for which is here. Have you given something new and organic a try this month? A creamy healthy pea soup, hearty and flavourful beef stew and a glorious pavlova….what a delicious meal! I’m also a big fan of organic and buy 90% of my food organic. The main fall back of course is the price 🙂 I also revert to soup when I’m on a budget or need to use up ingredients in my fridge. Your soup looks absolutely delicious!! Love this challenge! And, what a great-looking meal. The color of the soup is gorgeous! That is one fabulous meal! You sure did great on this challenge! what a GORGEOUS color! i love peas, particularly in soups, and the simple presence of bacon makes this soup even more irresistible! bravo! This looks so good! I am currently obsessed with making soup. I am definitely going to try this soon! The pea soup’s color is fantastic! It looks and sounds delicious. This is the simplest peas soup I’ve seen. Love the use of fresh frozen peas and the color is glorious! The soup looks really nice and tasty! and such a lovely color!